CDRoms of older U. S. Department of Labor data can be ordered from this site. The site also includes descriptions of the data sets. This is a comprehensive collection of tables with hard-to-find historical statistics. Find stats on workers and immigrants. Also available in print. Find scanned copies of BLS catalogs that list BLS publications from 1886-1998. Full text of the publications described in the catalogs can be found in U. S. libraries as well as in some historical subscription databases. Find a wide range of government-produced statistical tables from 1789-2012. Be sure to look at the tables' footnotes for find the recording agency. After 2013, data published as ProQuest Statistical Abstract of the U.S., listed separately. Call Number: ILR Reference HD6657 .E335 2000; accompanying CD-Rom. 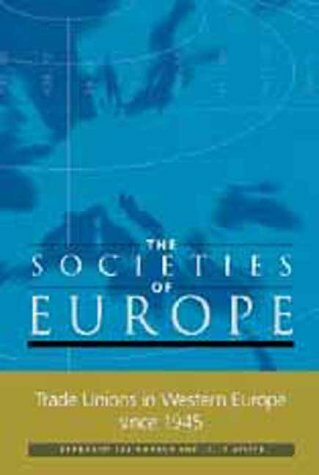 This reference traces the evolution of trade unions in Europe over the later half of the 20th Century. It provides a country overview of the union movement, chronologies, and membership tables. Use the accompanying CD-ROM to create custom spreadsheets from the wealth of data in the handbook. Contains tables that describe individual labor unions and the labor movement from 1897-1985. This is a unique compilation with a wealth of information. Online research tool designed to provide quick and easy access to modern and historical census data and demographic information. Create fast, intuitive, and illustrative maps and reports to help visually analyze and understand demography and social change throughout history. Site currently includes data from the entire US Census from 1790 to 2000, all annual updates from the American Community Survey to 2008, original Census tract-level estimates for 2006 and 2007, the Religious Congregations and Membership Study from 1980 to 2000, and 2002 Carbon Emissions Data from the Vulcan Project. CEIC Data contains economic, industrial and financial time-series data. Our Global Database offers unprecedented coverage of 221 countries in Asia, Europe and Central Asia, Middle East, Africa and the Americas. EIC also offers 18 macro-economic concepts, and 1,400,000 time series. Data comes from analysts on the ground and the prime national and regional statistical agencies and major industrial data issuing organizations of each country covered. The CEIC Data Manager provides access to the entire CEIC database from within the Microsoft Excel spreadsheet application. Times-series can be directly retrieved from the database and imported into Excel for quick analysis. A new online, open access, collection of all World Development Reports since 1978 was launched today by the World Bank. The Complete World Development Report Online, which allows users to easily access and search across these World Bank annual flagship publications, is free and open to the public. Provides links to the various tools that can be used to access and manipulate Census data. Excellent and growing source for raw data, including 5 pages on data sets on labor and employment. The page provides various ways to access BLS data. Include Key Indicators of the Labour Market, an easily accessible, reliable, and user-friendly tool providing timely information on labor markets. It compiles data from hundreds of countries on workforce participation, employment and unemployment indicators, education, wages, productivity, market flows, poverty, and income distribution. Another site to watch. Google is adding new public data every week. (Information about database. Database must be requested.) The ILO has created a database on trade union membership. It contains data for 45 countries from 1990-Available in Excel files on request from the ILO Bureau of Statistics. Cornell is a member institution. After registering, Cornell users can view and download over 500,000 digital data files, including many relating to labor, organizational behavior, and public policy. The data sets are often connected with academic studies. This resource is well worth a detailed look. A nonprofit education and research organization and data repository located at the University of Connecticut. Provides a history of the Center and information on the development and methodology of public opinion polling. Maintains a data archive of public opinion polls conducted or sponsored by major polling, media, and public policy organizations such as Gallup, Roper, ABC, CBS, CNN, NBC, Pew Research Centers, New York Times, USA Today and Wall Street Journal. The data held range from the 1930s to the present. Most of the data are from the United States, but over 50 nations are represented. The iPOLL databank offers access to nearly half a million survey questions and answers asked in the US by more than 150 survey organizations.Direct links are given to study documentation and datasets ready for instant access and express downloading through RoperExpress. SourceOECD is the online publications portal of the Organisation for Economic Co-operation and Development. SourceOECD, when complete, will comprise 19 Studies by Themes, containing all our monographs and reports; 19 periodicals online; some reference titles online; and the OECD statistical databases online.